As an employee of your company you are representing them and their ethos any time you are doing business. Therefore, it is important that you create the right impression whenever you are at work - whether in the office, away at functions or meeting clients. From the way you dress to the things you say, you need to make sure that you remain professional and represent your company in a way that they would feel happy with. Think about what your company's persona is, what they stand for and what image they are trying to uphold. It is true that first impression really do count and people will make judgements about you within the first few seconds of meeting you. These first impressions can be very difficult to break so you want to do your best to present the right image. Always make sure that you arrive on time or call ahead if you are delayed as people hate to be kept waiting. Greet people with a firm handshake, good eye contact and a smile and always make sure that you are well presented from head to toe. The way you dress needs to reflect your company image. Whether you work for a formal business or a much more relaxed company, make sure that you dress appropriately. Also, remember that while you may be able to be less formal at work in the office, you probably need to think more about what you are wearing when meeting people outside the company. Invest in good quality key pieces that can be relied upon to keep you looking professional and can be updated with accessories. When you are representing your company at work you need to remain professional at all times. Firstly, get the basics right. Arrive on time and have everything with you that you need. Don't take unnecessary phone calls or leave meetings half way through. Also, try to present a professional attitude at all times. If somebody angers you or says something stupid try to rise above it and stay neutral in all situations. The way you present yourself at work, your attitude and your actions will all work together to help you maintain your company's image. Be careful not to let it slip though. At social functions, especially after a few drinks, it can be easy to slip into off-work mode. Don't let this happen by monitoring how much you drink and making sure that you stay professional at all times. Creating and maintaining the right company impression will help you be respected by your colleagues and clients and be good for your career progression. 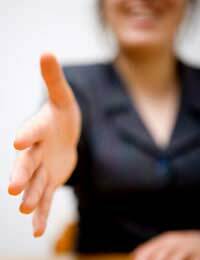 First impressions count so make sure you are always on time, are well prepared and have a warm and friendly attitude. Present the right image by dressing appropriately and staying in-line with your company's ethos. Remain professional at all times by never reacting adversely to situations and not letting your image slip at social events.